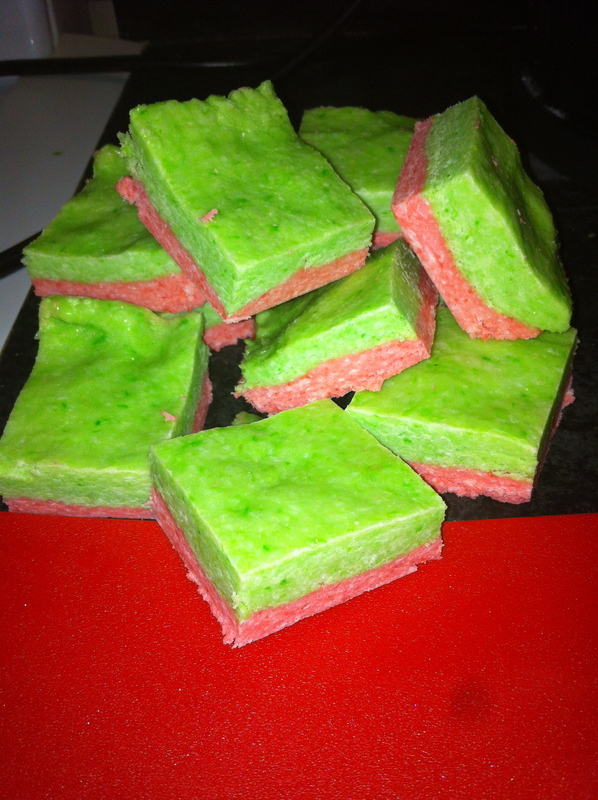 Coconut ice is a super simple idea for your homemade Christmas gifts. It tastes yummy and it involves no baking – so it’s easy to whip up after work without having to spend hours in the kitchen. It does need a bit of setting time, so I generally try and make it the night before it’s needed to make sure it’s completely hard by the time it needs to be cut. 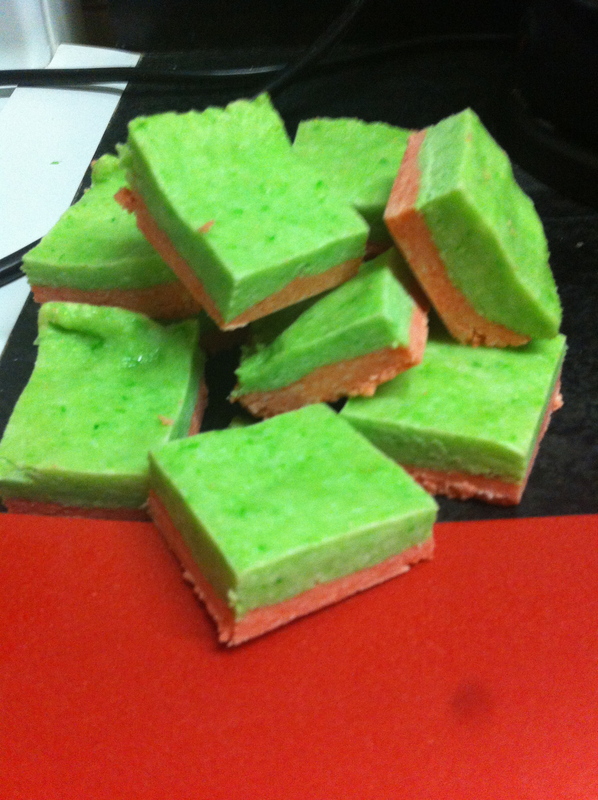 Coconut ice is traditionally pink and white and something you munch on after a school fete. But I am a big advocate for coconut ice’s multiple occasion uses. For Harvey’s birthday back in June, I made a batch in green and white; for our pink piggies party, Harvey’s Mum made a batch in pink and rolled it into bite-sized balls; for my 30th, I made it in blue and white… the colours are only limited to your imagination (and what colours you have). 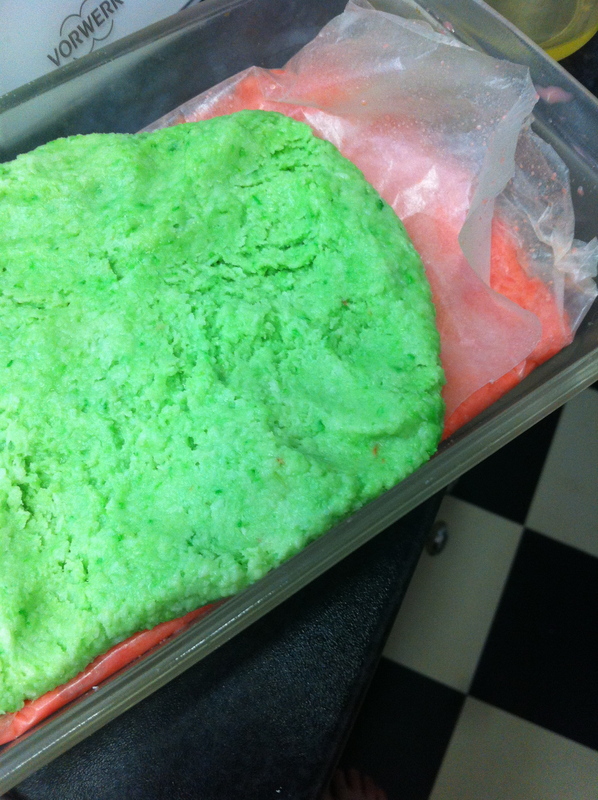 I made red and green ice for coconut ice to give it a Christmassy look. Red isn’t really a colour that works well because mixing it with a white base generally yields a pink result. I used Wilton Red Red Colouring and got a much closer to red result than I have in the past. 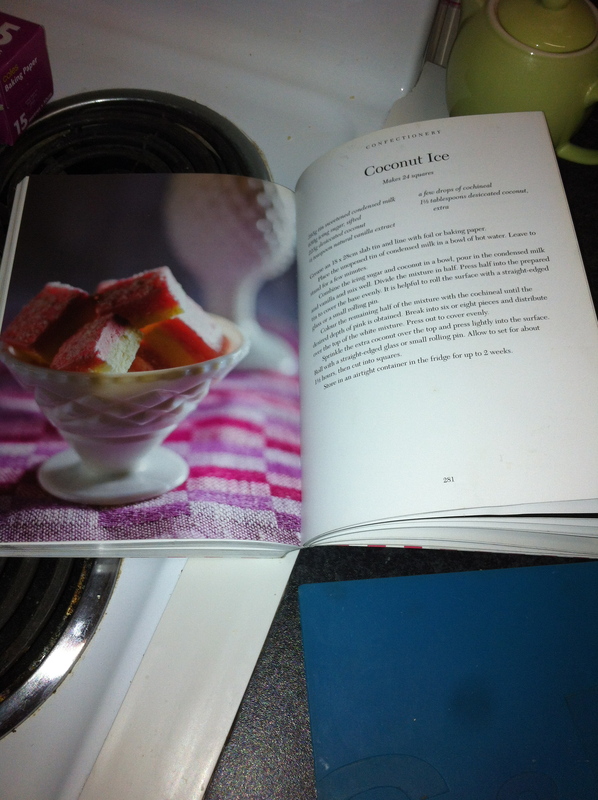 My favourite recipe for coconut ice is from Sally Wise’s Sweet! Cookbook, which I have posted about on here around a million times. The lovely people at ABC books have given me permission to repost for you lovely readers. Thank you ABC Books! Confession before we start: I reduced this recipe by half because, woah nearly 600 grams of icing sugar is a lot, and I’m trying to save on fridge space and ProPoints and giving my friends and family small tastes of lots of sugar! So, the recipe listed is Sally’s, with my quantities in brackets. I also used skim sweetened condensed milk to reduce the ProPoints slightly. Grease an 18x28cm slab tin and line with foil or baking paper. Place the unopened tin of condensed milk in a bowl of hot water. Leave to stand for a few minutes (Or, if you are cooking this in December in Queensland, skip this step. It’s warm enough to thin the milk down so you can mix it). Combine the icing sugar and coconut in a (large) bowl, pour in the condensed milk and vanilla and mix well. Divide the mixture in half. If having a white layer, press half into the prepared tin to cover the base evenly. It is helpful to roll the surface with a straight-edged glass or small rolling pin. Colour the remaining half of the mixture until the desired depth of colour is reached. Break into six or eight pieces and distribute evenly over the top of the white mixture. Press out to cover evenly. (If using) sprinkle the extra coconut over the top and press lightly into the surface. Roll with a straight-edged glass or small rolling pin. Allow to set for about 1 ½ hours, then cut into squares. From a half mix, I ended up with 20 serves at 4 ProPoints each. For the full recipe of Sally’s, made and cut in the traditional way, she says it serves 20-25 people which would be 6-7 ProPoints each piece (the more serves, the fewer points) – however, Sally’s recipe uses normal condensed milk rather than skim, which would make hers 8-9 ProPoints. If you’d like to pick up a copy of Sweet! By Sally Wise (and I totally recommend that you do! ), visit the ABC Books page here. For packaging, I used cellophane bags with some ribbon I picked up from The Reject Shop. *Sally Wise recipe posted with permission of ABC Books. Approval number AB13/025.